The house that stood at 221 South Olive may not have been as ornate as some of its Bunker Hill neighbors, but unlike the homes of Margaret Crocker and L.J. Rose, the residence on Olive survived from the earliest days of the neighborhood until the bitter end. Set back from the street, up two small sets of stairs, and surrounded by foliage, the fading Victorian beauty was a popular subject of the photographers who documented the Hill in its waning years. The mansion was built in 1887 by Herman F. Baer, a real estate developer who was responsible for a number of residences in the area. The original address of the Baer home was 117 South Olive, but soon became 221 South Olive due to further development of the area and an 1889 ordinance renumbering street addresses. When the property was surveyed prior to its demolition, the American Institute of Architects noted that the house bore a striking resemblance to the design style of local architects Samuel and Joseph C. Newson. By 1891, Baer was out and the Doran family was in. John J. Doran operated a stationary shop on Main Street which also provided the city with school supplies, fine pictures, candles, vegetable & olive oil, magazines and a well assorted stock of Catholic books. Doran passed away in 1892, but his widow Mary, their son, and three daughters continued to live on Olive and threw parties worthy of the society pages. The Dorans left Olive Street around 1905, selling the property to R.A. Fowler who unloaded it a couple of years later for $26,500 (over half a million in today’s dollars). By this time, the residence had been converted into a boarding house. Compare to many boarding houses in the neighborhood, the Baer/Doran house witnessed very little excitement. In 1926, resident Albert V. Herndon bought a train ticket to Kansas to visit his ailing father and was never heard from again. On a less morbid note, boarder Thorsten Anderson left his Olive Street room in 1930 on Labor Day to go to the Plaza for a pro-Communist demonstration. He and seventeen other participants spent the night in the slammer when they were arrested for disturbing the peace. In keeping with the public disturbance theme, resident James C McLean was hauled out of his room and arrested in December 1934. At that time, the City was in the midst of a transportation strike and McLean was accused of setting a streetcar at Third and Bixel on fire. Though he denied being responsible for the incident, the burns on his hands made the police think otherwise. While the neighborhood continued its downward decline, the house on Olive street maintained its peaceful existence. By 1939, the house had been divided up into fourteen different residences. According to the WPA household census, boarders paid from six to twenty dollars a month in rent and had lived in the house for a month up to sixteen years. Unlike many of the Victorian mansions getting on in their years, the Olive house was in decent condition, only requiring minor repairs. The picturesque mansion house survived without incident into the mid-1960s. 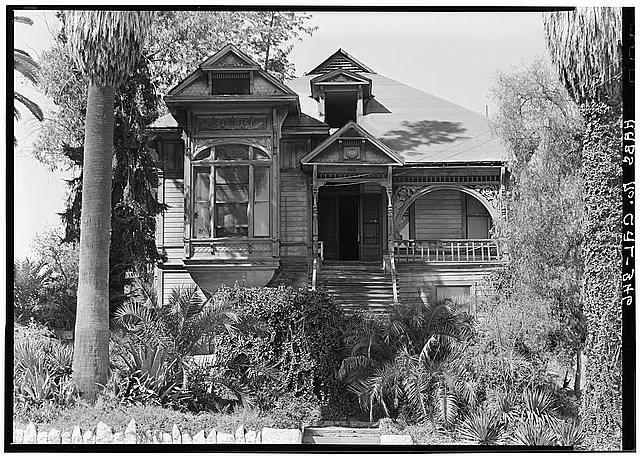 In 1964, the Community Redevelopment Agency purchased the property from owner Louis Swiatel in order to demolish it. After fifty seven years, the house at 221 South Olive Street was no more.